FUTURE European fishing regulations will be guided by the principle of sustainability, a yardstick by which the EU is currently lagging behind the US, Australia, New Zealand, and others. EU Commissioner for Maritime Affairs and Fishing, Maria Damanaki, believes that greater sustainability will emerge once EU-wide backing is gained for a new Common Fisheries Policy within the next six months, during Ireland’s presidency of the EU. Employment in the European fisheries sector has potential to grow by 35,000 jobs (+30%), built on a longer term view of harnessing the full added value of sea stocks, with the latest marine technologies to assess fish stocks on a species by species basis. These potential jobs are part of an EU estimate of the likely gains from sustainable fishing, maximising the added value from the catch, enhanced technology usage and diversification — what it calls “blue growth” via pesca-tourism and sustainable coastal development. Science will play a critical role in defining sustainable limits of fishing for each species. The Marine Institute in Galway’s Real Map of Ireland has become something of a poster project for the EU. This map tracks the changing life patterns in Ireland’s 220m-acre marine resource in Ireland’s current designated Irish continental shelf, which is one of the largest seabed territories in Europe. “We are working science researchers like those in the Marine Institute in Galway to ensure we develop a sustainable strategy on fishing,” said Ms Damanaki. “We are gathering all possible data on fishing stocks. We are also taking a broader look at the sea, issues such as mining, wave energy, biotechnology and aquaculture, and looking at sustainability in regard to our ‘blue growth’ agenda. In framing its new CFP, the EU must also agree sustainable fishing strategies with groups governing other non-EU waters. Ten days ago, Ms Damanaki presented the EU policy towards the Arctic at the annual Arctic Frontiers Conference. The EU wants to be a permanent observer to the Arctic Council. Last week, she joined with Minister of Agriculture, Food, and the Marine Simon Coveney to present Europe’s CFP reform goals in talks between the EU and Norway on multi-annual management plans. This week, Ms Damanaki and Mr Coveney will seek to set a schedule for the Fisheries Council’s CFP talks. Proposals on the table include regulations for reform; regulation on the common organisation of the markets in fishery and aquaculture products; and regulation on the European Maritime and Fisheries Fund. The new EMFF fund will help deliver reform goals, help fishermen move towards sustainable fishing, and help coastal communities diversify. The fund will finance projects that create new jobs and improve quality of life along European coasts. It will replace the existing European Fisheries Fund and a number of other instruments. The proposed envelope amounts to € 6.5bn for 2014 to 2020. If framing this budget, the Commission is seeking to emulate the relative success of the US, where only 21% of stocks are overfished, and where the fishing industry is worth €150bn and provides 1.5m jobs. In the EU, some 47% of stocks are overfished in the Atlantic and 80% in the Mediterranean. Furthermore, while catches in volumes are 20% higher than in the US, the EU’s fishing industry only generates earnings of €35.6bn and provides 310,000 jobs, of which 138,500 are in the catching sector. The EU is setting itself the goal of promoting growth and jobs in the sector; its projections for 2020 target increases of 20% in catches, 24 to 25% in incomes and 30% in jobs. This will involve some diversification. For the Irish fishing industry, some €1.5m is being made available for Fisheries Local Action Groups to fund local development plans and projects in Ireland. Sustainable fishing is intended to carefully increase catches by 20% overall, while generating socio-economic benefits in the medium to longer term. “We will give incentives to fishermen to have better gear,” said Ms Damanaki. “We will fund up to 80% of the gear for smaller fishermen, and 90% for the larger fishermen for their gear. We will also be working in the Irish presidency to develop a strategy that will see the industry extract the best added value for the fish that is landed. Last week, Mr Coveney chaired the first meeting of Ireland’s presidency of the Agri/Fish Council. He citedthe reform of the CFP as the number one fishing priority for the six-month programme ahead. By the end of June, he hopes that member states can agree targets on maximum sustainable yields, the elimination of discards, and regionalisation. “I trust in the capability of the Irish presidency to get the results we need within the timeframe, and to keep our ambitious targets for sustainability on the right track,” said Ms Damanaki. The Federation of Irish Fishermen chairman has also led a call for the EU to take firm action against Iceland and the Faroe Islands for breaching trade agreements by overfishing agreed mackerel catches. Ms Damanaki said that the EU has numerous trade weapons at its disposal. While hoping to avoid any return to fish wars, the EU’s research has shown this is a very important year in which to control fishing limits to allow certain species to mature. 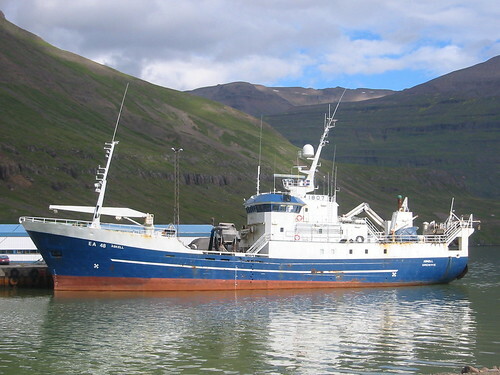 “The Commission also wants a very strict response, because overfishing of certain species by Iceland and the Faroe Islands will destroy these stocks,” she said. “The trade instrument in this case is to impose sanctions. Another major issue for Irish fishermen is the EU’s position on fish discards. The EU estimates that the Irish fishing fleet is discarding more than half of its catch across a range of species to comply with regulations. Most often, while catching one species in their nets, fishermen are obliged to throw back other species for which their quota has been used up. They also have to throw back fish that are legally undersized. Fishermen also throw back fish that are of low value so as not to use up quota on low grade fish. In 2011, the Irish fleet had to discard 54% of its haddock, 55% of plaice, and 52% of its cod, plus large volumes of lobster, whiting and anglerfish. Mr Coveney has been seeking a new approach that would take into account the difficulties for fishermen of changing practices, the economic impacts and other constraints relating to mixed fisheries. Proposals for the CFP talks will look at increasing mesh sizes, the use of square mesh or excluder grids. Critically, the talks will look at the obligatory landing of all catches of regulated species, to count against quota. Obligatory landing will be introduced gradually, starting with those best equipped to adapt. The most poorly equipped fleets will be given more time to prepare.